In 1947 the explorer Richard Byrd flew to the South Pole, and when he returned, he is believed to have described finding an entrance to the center of the Earth. From there, people have speculated that people or creatures inhabit this space, flying out whenever they like, but having very little to do with those of us on the surface. To date no one has a convincing argument backed by scientific evidence just what is at the center of the Earth, so the speculation Byrd initiated goes on. This is a must watch and listen to video interview. I wasn’t able to embed this video, yet I have linked it. Just click the link and bookmark it – It is 3 plus hours in duration. 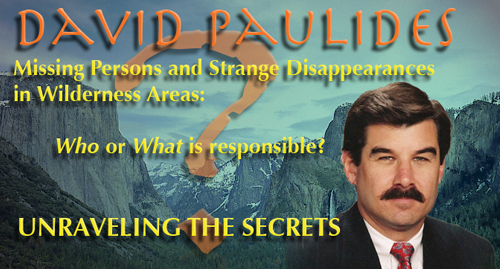 We interview David Paulides about his books Missing 411. A tip from a national park ranger led to this three year, 7000+ hour investigative effort into understanding the stories behind people who have vanished. The book chronicles children, adults and the elderly who disappeared, sometimes in the presence of friends and relatives. As Search and Rescue personnel exhaust leads and places to search, relatives start to believe kidnappings and abductions have occurred. The belief by the relatives is not an isolated occurrence; it replicates itself time after time, case after case across North America. “Billy” Eduard Albert Meier (born February 3, 1937) is a citizen of Switzerland who is the source of many controversial UFO photographs. He presents these photographs as evidence to support claims that he is in contact with extraterrestrials. In addition, he has also presented other controversial material during the 1970s such as metal samples, sound recordings and film-footage. Meier reports regular contacts with extraterrestrials he calls the Plejaren. Meier claims that the Plejaren look similar in appearance to humans from Northern Europe, and states that the Plejaren homeworld is called Erra. It is located in a dimension which is a fraction of a second shifted from our own dimension, about 80 light years beyond the Pleiades, an open star cluster. The Plejaren were given the name Pleiadians by Meier up to 1995.